Hi! Today's card was made for the current Muse Challenge, the CAS theme at Addicted to Stamps and the Anything Goes Challenge at Simon Says Stamp. 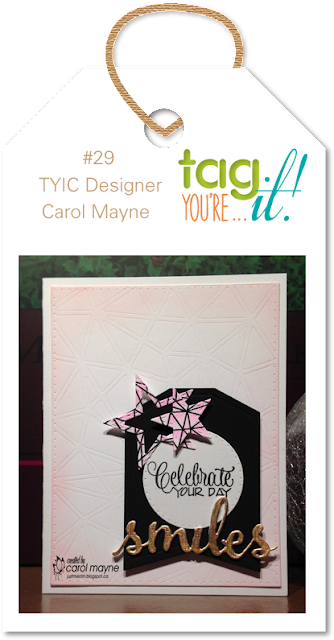 The inspiration I took from Tracey's fabulous card was the general layout with the vertical image, the horizontal banner and the flowers. I also tried to stick close to the colors Tracy used and the white-embossed, non-scripty font on the sentiment. 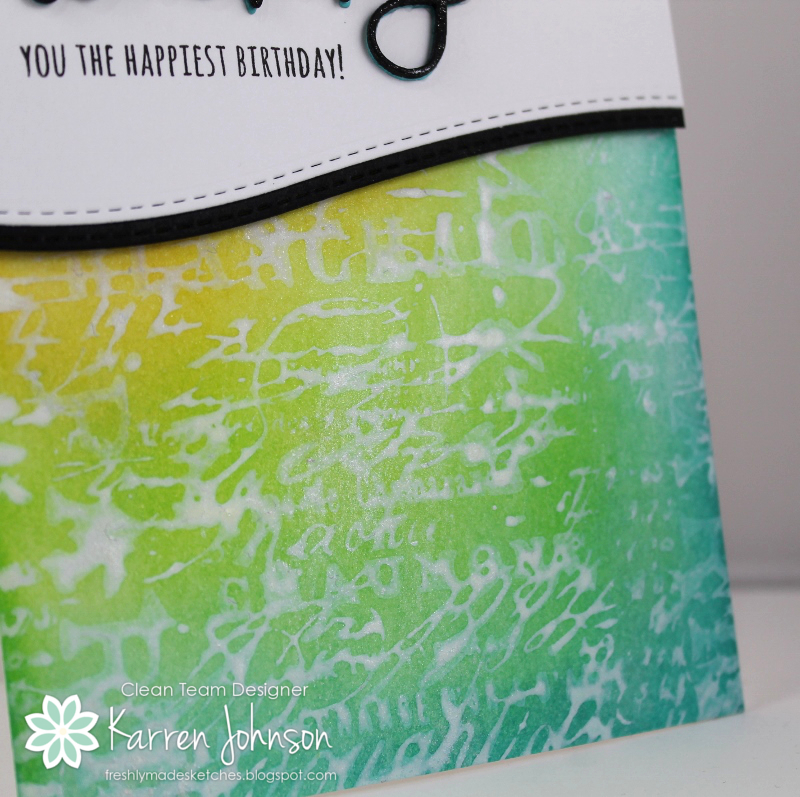 For the vertical part of the layout I used a stencil and some embossing paste. The banner was sponged with Melon ink and then white-embossed and die cut. The flowers were colored with Copics before being die cut and popped up on foam tape. Behind the flowers and banners is a wad of silver thread. 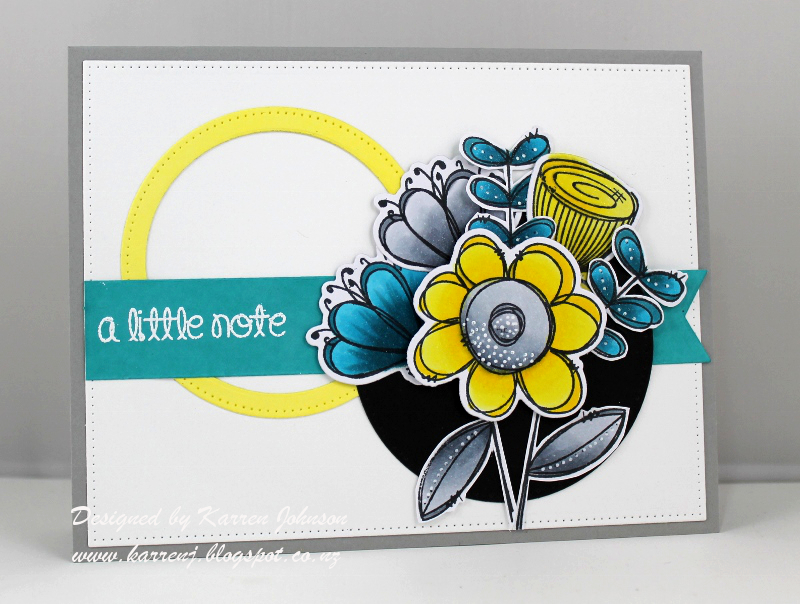 Edited to Add: This card got a shout out at Muse Challenge. 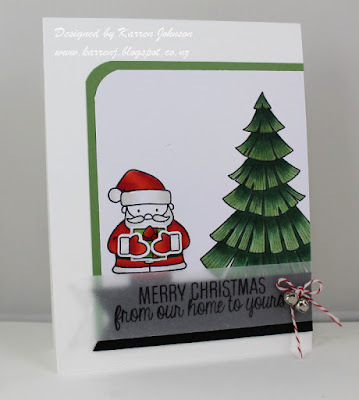 I'm so excited to be a guest designer at Tag You're It this week, due to my card winning a recent challenge. 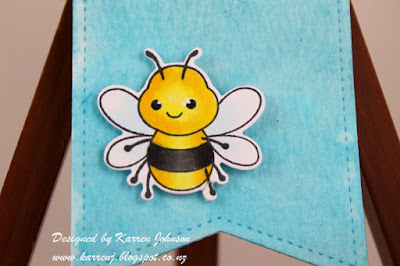 Here is the beautiful inspiration tag made by Carol Mayne. 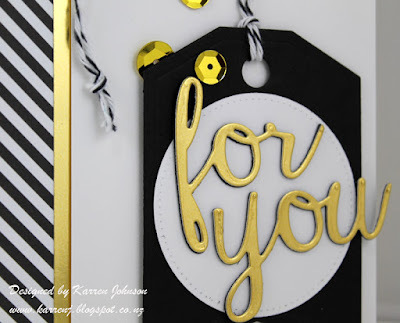 I was really drawn to the black, white and gold color scheme as well as the circle element on the tag. 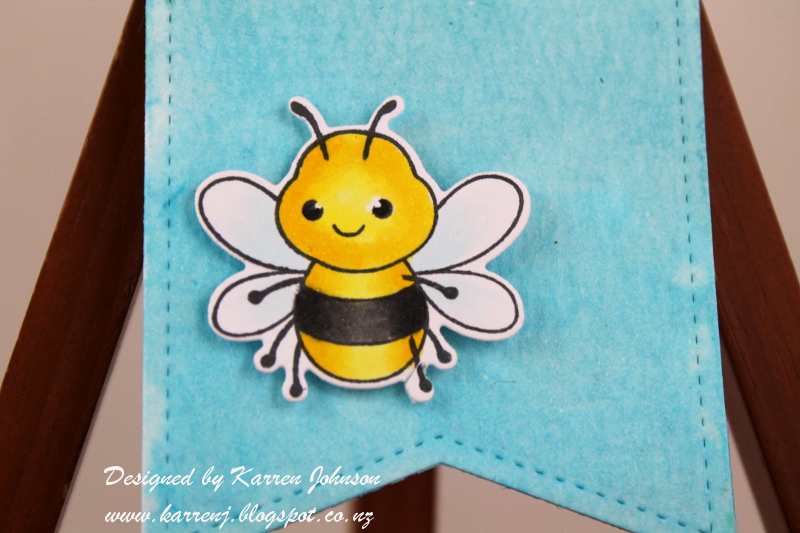 I didn't have anything graphic for the background like Carol's card so I went for some stripes instead. I die cut the sentiment from gold foil cardstock and layered it up about four deep with black cardstock. On the card base I adhered some striped paper and a strip of gold foil. The white layer is popped up on foam tape as is the tag. I finished the card with some gold sequins to mimic the stars on Carol's card. Thanks to the Tag You're It team for letting me "tag along" this week :) Be sure to check out the beautiful and clever inspiration from the rest of the team. The horizontal element is the horizon and the vertical element is the palm tree. 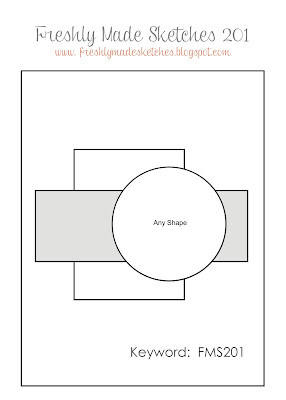 The circle element is the shaker. I just adored the Penguins in Paradise set as soon as it was released and am so glad I now have it. This penguin is just too cute! 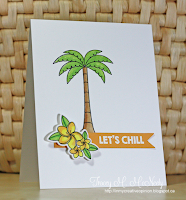 I cut and colored him, along with the palm tree before setting them aside to work on the card base. I first cut the circle so I knew where I wanted my sea and sand to meet. I then carefully sponged on both the card base and the top panel so they lined up. I used white and silver flat sequins as well as some clear Rock Candy Distress Glitter in my shaker. After making the shaker component, I put everything together. The glitter has given the acetate a frosted look which is really pretty. Thanks for visiting. As always, the design team have some wonderful inspiration for you, so be sure to check them out. Hi! I managed to take some time today to join in with the current Tag You're It Challenge, where my friend Jen Mitchell is the designer. Jen used an adorable bear on her tag, so I decided to follow suit - to a degree - and use a critter. 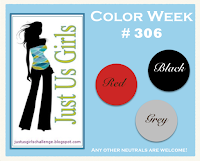 I took the basic layout and the background color as inspiration from Jen's tag. I also used an offset banner for the sentiment. A lot of people put their NBUS to one side and don't file it away until they've used it at least once. I never did that and always filed my NBUS as soon as I got it. Maybe because I was scared the pile would topple over and bury me :) I got a few orders in over the last couple of weeks and decided that this time I would keep it separate from my other product until I've used it. I'm making inroads and this is another new set that can now be filed. Today's card used the (flipped) sketch from CAS(E) This Sketch and the colors from Color Throwdown. 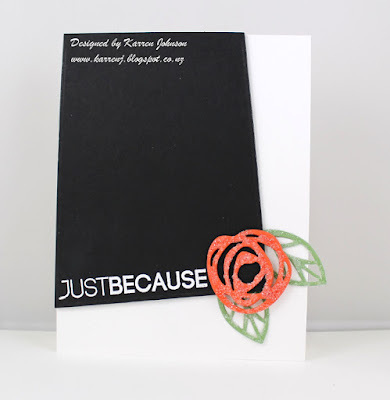 I white embossed the sentiment on the panel and die cut the flower and leaves from a NBUS set by Essentials by Ellen. I wanted to lift the die-cuts somehow so decided to lay down a bit of glue on the pieces and drop them into some Distress Glitter. It looks quite cool in real life. Hi! It's Friday night and I took a bit of time after dinner to make a quick card for a few challenges. 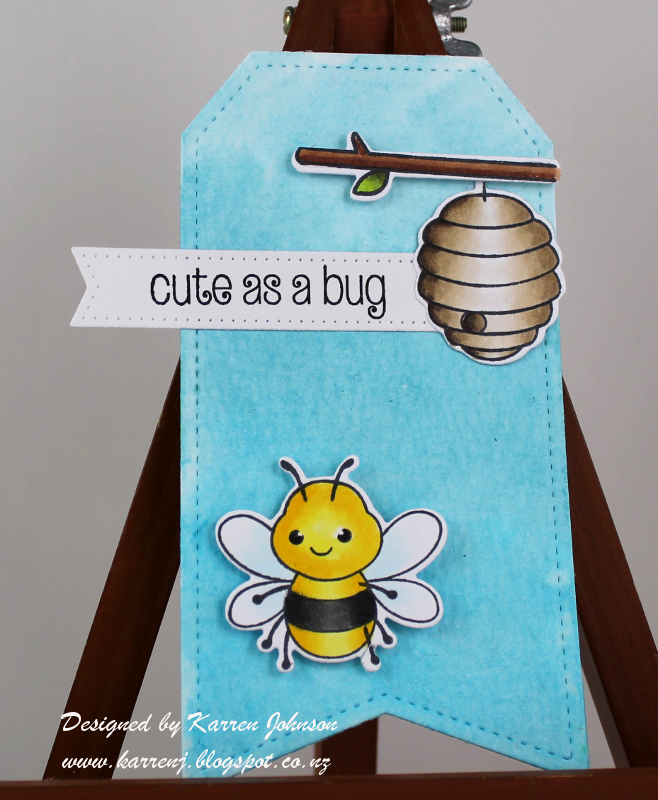 This card uses the inspiration pic at Time Out Challenges, the masculine theme at Just Add Ink, the Numbers cue word at CASology and the Around the Corner theme at City Crafter Challenge. Clearly I was inspired by the colors at Time Out. 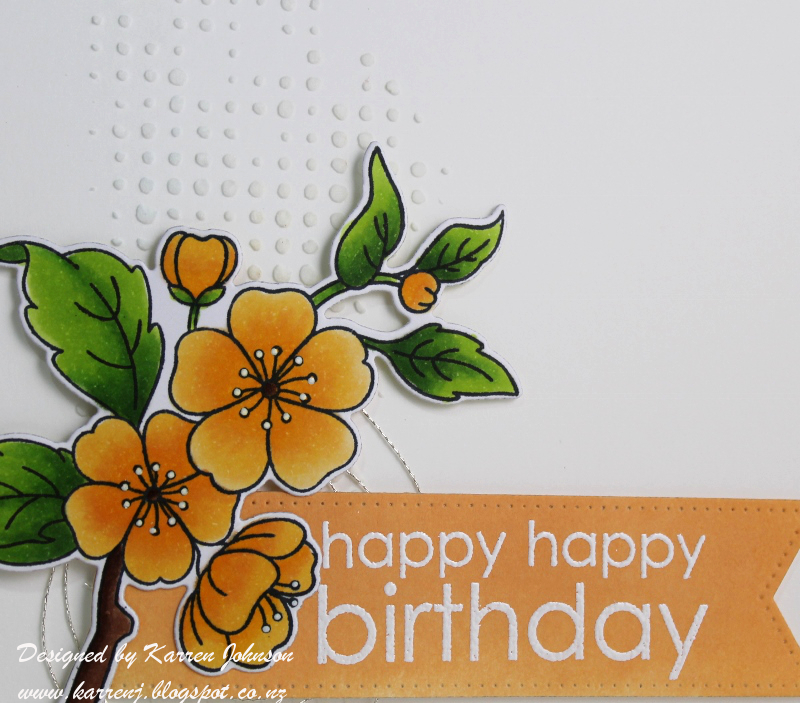 I kept my main image to the bottom right corner of the card and used a numbers stencil. I laid the stencil on a piece of white card and spread Versamark ink direct to paper on top. I then white embossed. 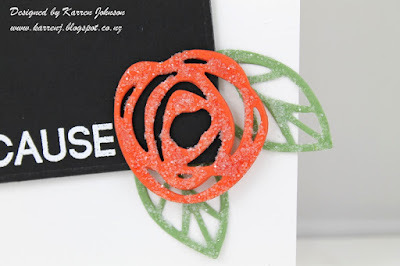 After that, I used some acetate and distress inks to smoosh the inks over the embossing. 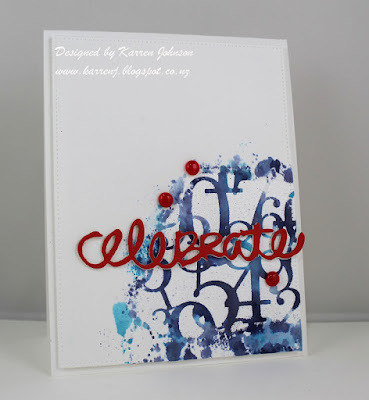 The sentiment was die cut and layered up with three white layers and one Lipstick Red. To finish off the card and keep it masculine, I used some enamel dots. The whole layer is popped up on the card base with foam tape. Edited to Add: This card got a shout out at Just Add Ink and City Crafter Challenge Blog. Hi and welcome! Today is a very special day because Freshly Made Sketches is celebrating its 200th challenge and, boy, are we celebrating! If you came here from the FMS blog, you'll know what I mean, but if not, be sure to check out the blog. We have some amazing prizes from some of the most well-known companies in the stamping industry. 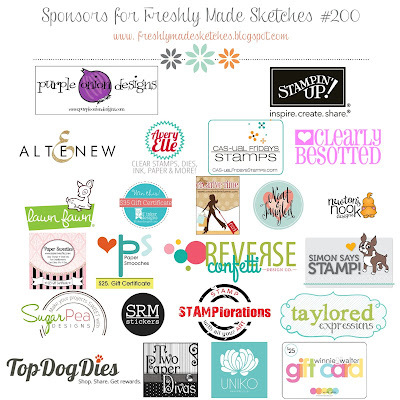 We also have some amazing cards using the sketch from several of the sponsors' design teams - and there are some real stamping celebrities! Before we get to my card, I just want to take a moment to thank Jennifer Timko and Jen Mitchell for all the hard work they've put in behind the scenes to make this celebration possible. These two are legends! And of course, we have to thank Lesley Croghan who started the challenge and is still there helping and joining in when possible. Now onto the sketch. This is a wonderfully open sketch and has so many options. 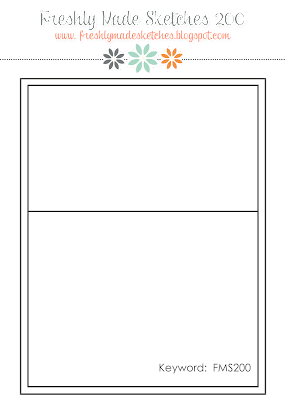 Luckily for me, the idea for my card came pretty quickly, so I got it down on paper as soon as I could. I wanted a sponged background and to use one of my favorite text stamps from Tim Holtz, so I started by sponging Peacock Feathers, Twisted Citron and Wild Honey, moving from the bottom right to top left. 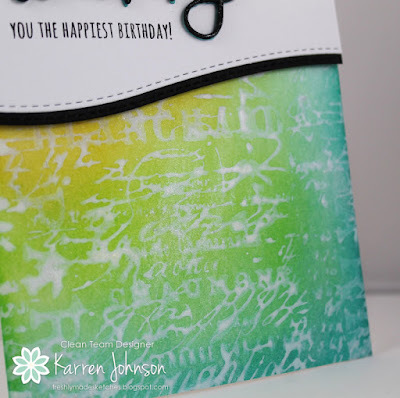 Once I was happy with the ink blending, I stamped the text stamp using Picket Fence Distress Paint. 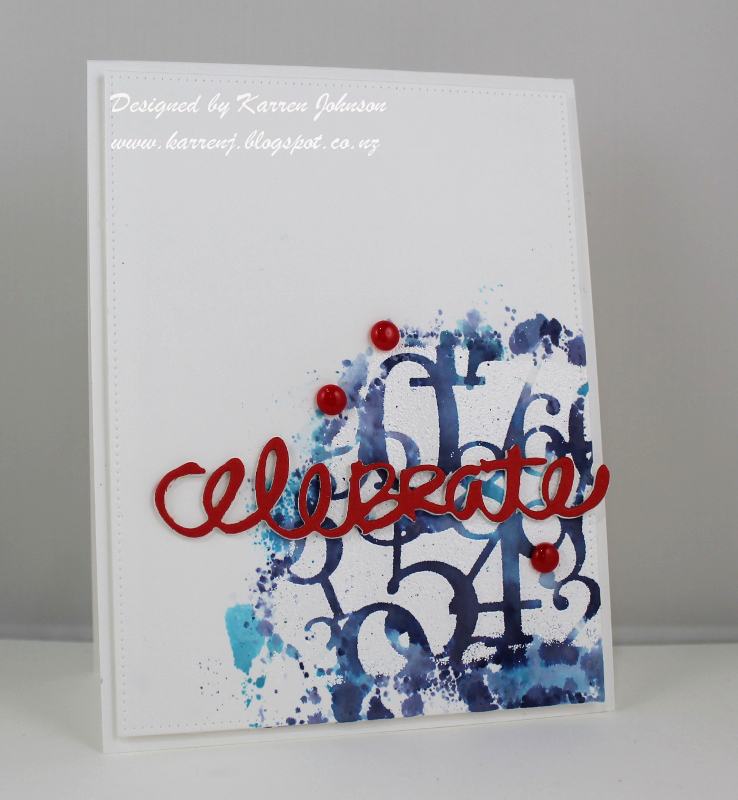 While it was still wet, I sprinkled on some Perfect Pearls, giving the card a lovely shimmer. 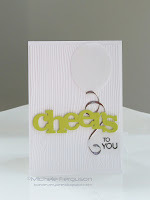 The top layer of the card was die cut with one of the dies from Landscape Trio in both white and black. I die cut the word "Wishing" in black, Audrey Blue and two in white before stacking them up with the blue on the bottom. I painted the die-cut with Wink of Stella for even more shimmer! Here are some close-ups to try and show you the shimmer. Thanks so much for visiting. Please check out the FMS blog and see all the lovely examples there from the FMS team as well as our guests. I hope you'll join the challenge as the prizes are amazing. Hi and welcome to another Merry Monday challenge. 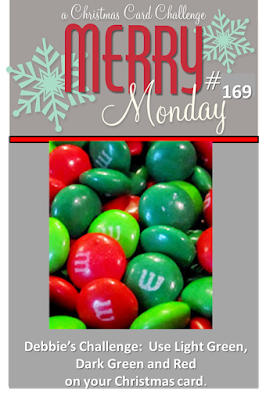 This week, Debbie is our hostess and she wants to see light green, dark green and red on our Christmas cards. 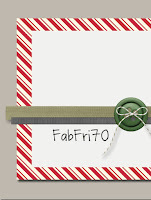 For my card, I pulled out the cute Cozy Christmas set and matching dies. I used the sketch at Fab Friday. The colored panel was layered onto a Wild Wasabi panel with rounded corner. The sentiment was stamped onto some vellum and layered on top of a black banner. To finish off the card, I tied two tiny tingle bells together with some striped baker's twine. Thanks for visiting. The rest of the design team have some fabulous cards using these colors so be sure to check them out. 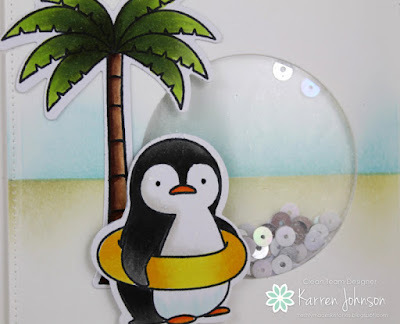 I had to play along at the brand new Pinterest Inspired Challenge when I saw the fun inspiration pic they had for us! 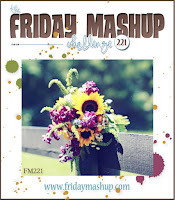 I combined that challenge with the sketch at Mojo Monday and the Summer Flowers theme at Friday Mashup and the Homegrown Summer theme at Simon Says Stamp Monday Challenge. I concentrated on the color scheme from the inspiration pic and the doodle-y flowers. I stamped a whole bunch of the flowers and foliage from Doodle Buds and colored them with Copic markers. And yes, I have teal leaves and grey flowers LOL. After I'd cut them out, I colored them all with Wink of Stella then added some dots with my white gel pen. 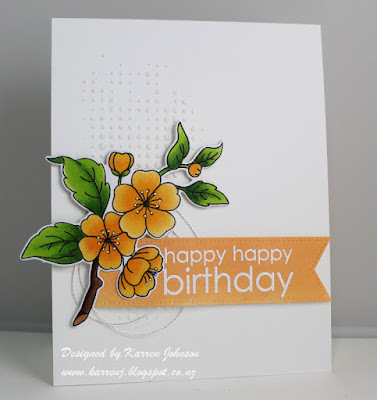 The yellow circle was cut from a piece of white cardstock I'd smooshed Squeezed Lemonade on to try and match the yellow flowers. The banner was done the same way using Peacock Feathers ink. It took me longer to arrange the flowers than it did to do everything else! I was trying to separate the colors and, of course, wasn't organised enough to plan out how my bouquet was going to look before starting to color :) I was happy enough with it in the end, so all's well. Hi, this is my second post today. Scroll down for my lighthouse card. 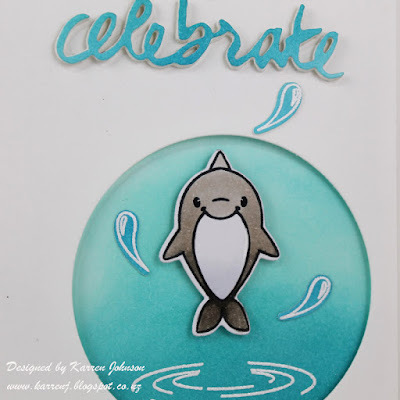 This card uses the Aquatic cue word at CASology, this week's Muse card and the colors at Color Throwdown - aqua, blue and grey. 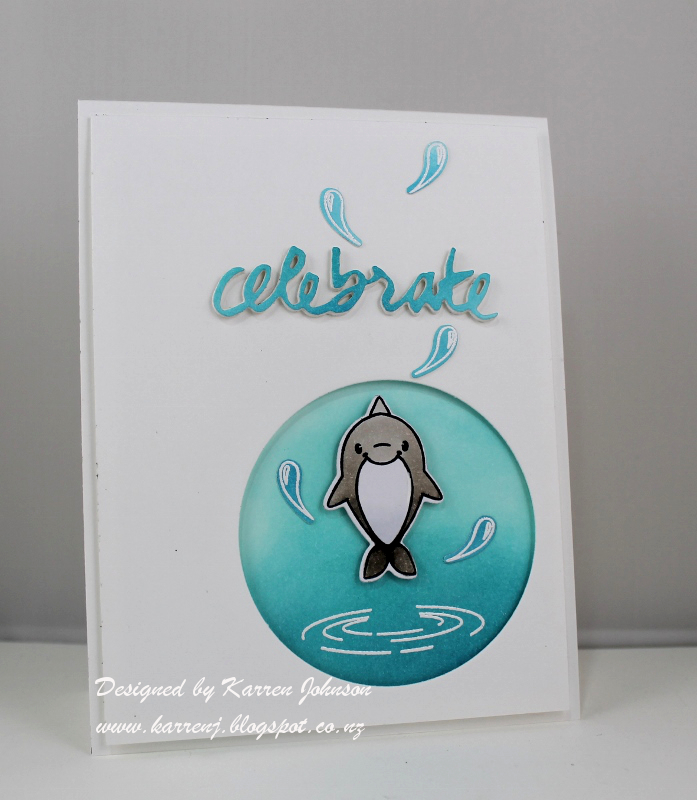 I used my new and cute-as-a-button Make a Splash set from Clearly Besotted. From Michelle's Muse card, I took the basic layout, flipping it upside down; the white-on-white layers; the circular element; the die-cut word and while I didn't have a streamer/balloon string, I did use the water droplets in a similar pattern. 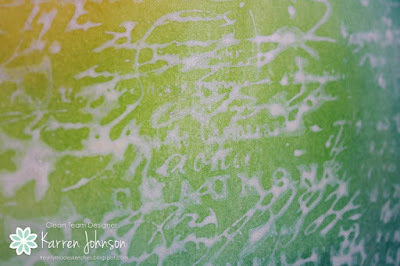 I sponged some Mermaid Lagoon and Peacock Feathers ink onto a scrap piece of white card before white embossing the ripples. 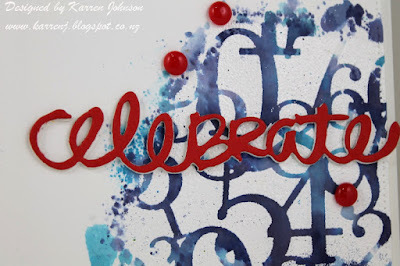 I then took some of the unused sponged piece and die-cut the word and the droplets which I'd white embossed. 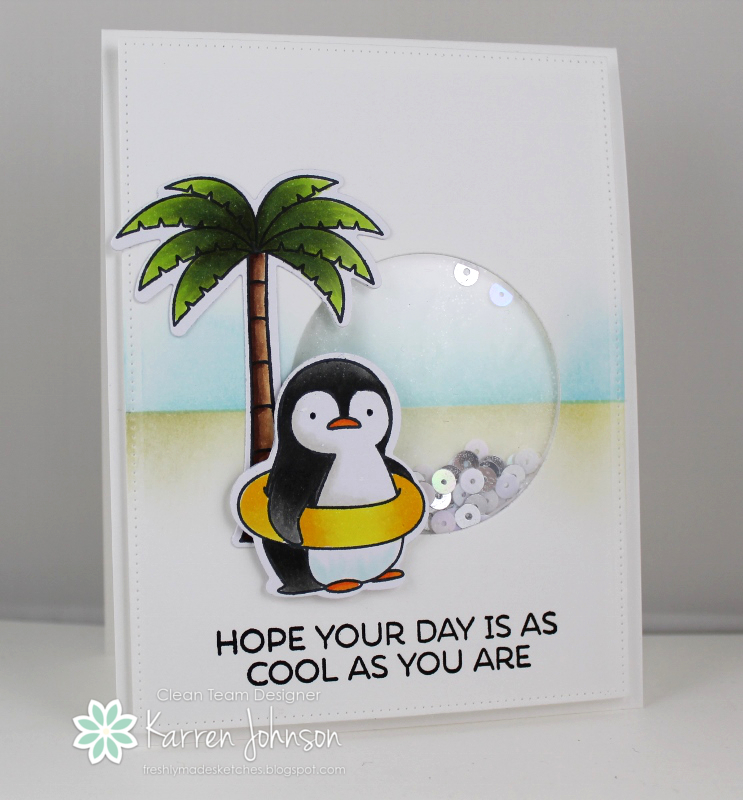 I cut a circle from a white panel and popped that up on the card base using foam tape. The dolphin was colored with Copics and I had intended to put him on an action wobbler, but completely forgot - doh! I'll have to see if I can lift him off the card because I think an action wobbler behind him would be a fun touch. 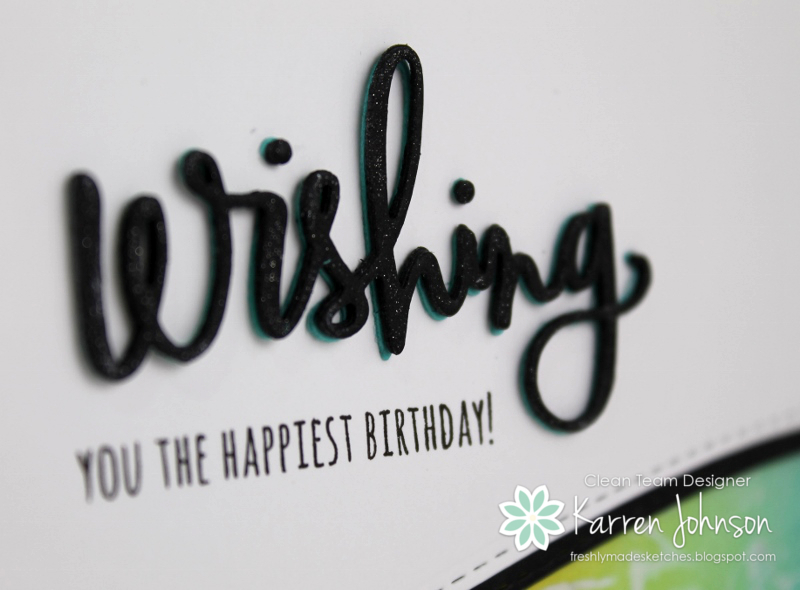 The die-cut word is stacked onto five white layers, giving it lots of dimension. 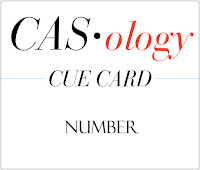 Edited to Add: This card got a shout out at Color Throwdown and CASology. Hi! I just got the Guiding Lights set from PTI and as soon as I saw the challenge at Just Us Girls, I knew this set would be perfect! I teamed that up with the sketch at Just Add Ink and came up with this card. 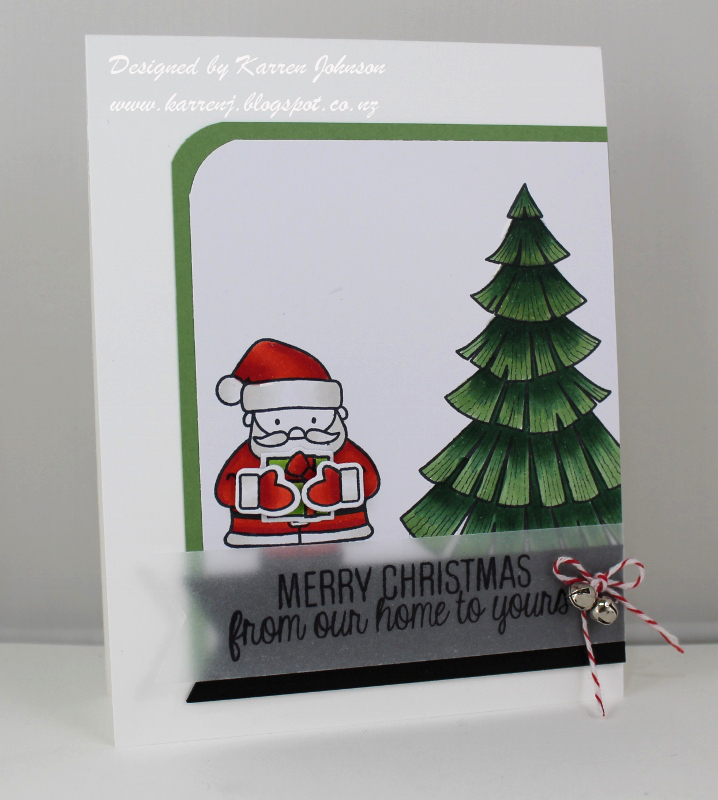 I started with a Slate card base and sponged over the Scribble Script stencil with Slate ink for a tone-on-tone look. The circle was cut with a pierced circle die and the sentiment and birds were white embossed to the left of the circle. 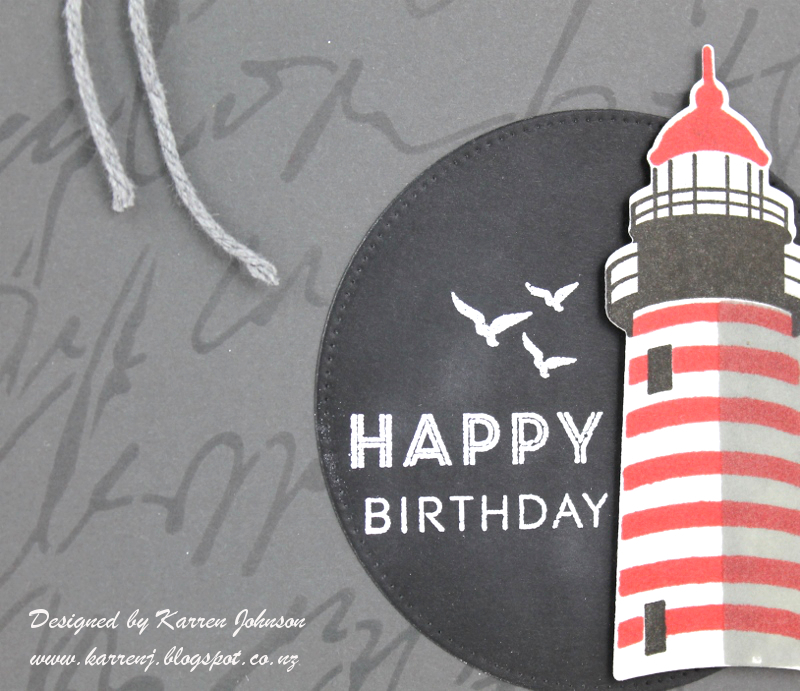 I die-cut then stamped the lighthouse, which was then popped up on foam tape. 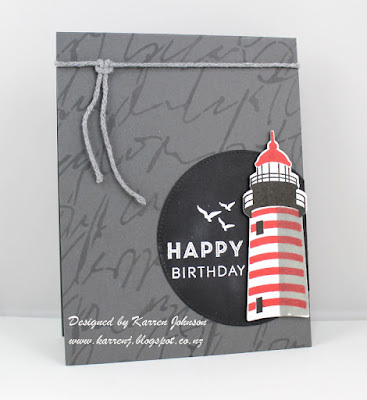 Some gray twine finished the card. Hi and welcome! Today's card kept me awake all night! I watched Sandy Allnock's fabulous videos on watercolor powders last night and when I saw the effect of the black Brusho powder, I immediately thought of a galaxy. Then I couldn't sleep plotting how to make this card, which uses the sketch from CAS(E) This Sketch and the Anything that Flies theme at Seize the Birthday. See! Isn't that black Brusho powder amazing! I took a piece of watercolor paper and sprinked on some black powder before spritzing with water. I then just put it to one side and left it to dry naturally. As you can see in the close up photo, there's a black hole in the bottom left corner where the black pooled :) Once it was dry, I flicked Picket Fence paint onto the panel with a paintbrush to mimic stars and planets. 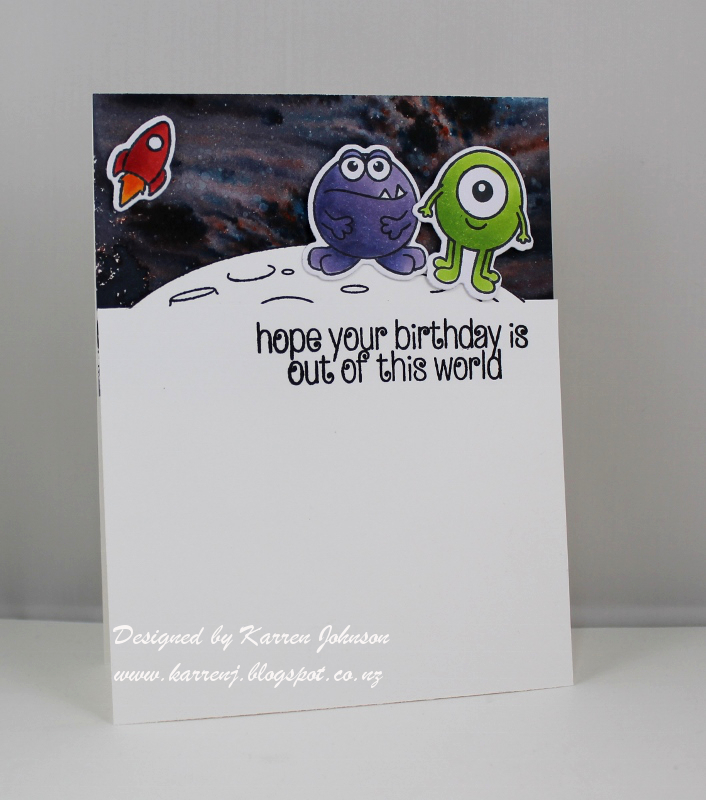 The images come from Clearly Besotted's new release set "Out of This World". I loved pretty much all of the latest release so quite a few of the sets have come to live with me. 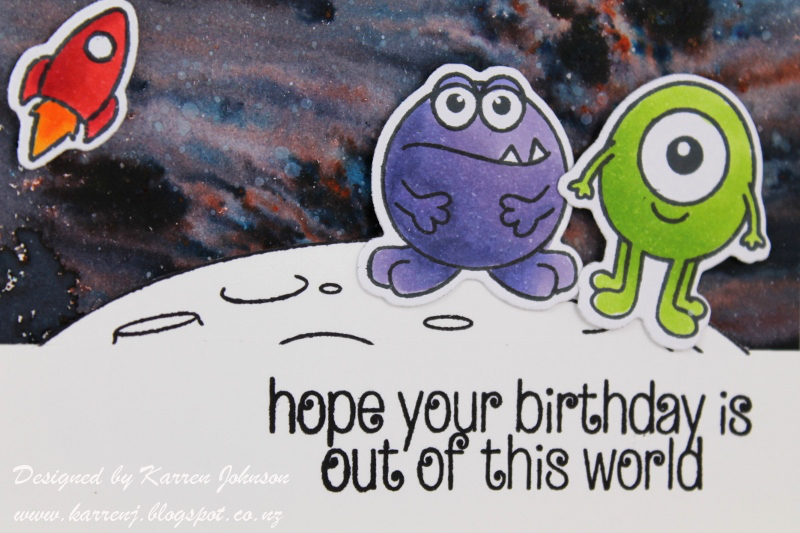 I stamped the planet onto a panel of white cardstock and cut around the top. The sentiment was stamped underneath and then popped up on foam tape on top of the "galaxy". The aliens and rocket were colored very quickly with Copics and also popped up on foam tape and my card was done. Thanks for visiting. I love this sketch and have another idea floating around my head, so if time permits, I'll be making another card using it.